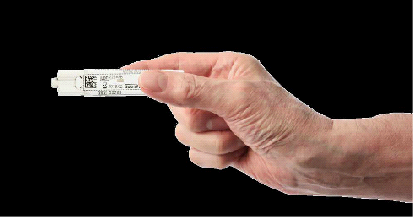 Scotland recently introduced a new FIT bowel screen test will require participants to provide one bowel motion sample only. The previous test required participant to provide 3 stool samples from different days. It is hoped that the new simpler test will improve participation in the program which invites individuals aged 50 - 74 years to submit a stool sample every two years. The screening programme is designed to identify precancerous polyps and bowel cancer at an earlier stage when it is more likely to be treatable and curable. Colorectal or bowel cancer is the third most commonly diagnosed cancer both men and women. Scotland has a higher rate of colorectal cancer compared to most other countries in the Western world. Each year around 3700 new cases are diagnosed and more than 95% cases occurring individuals is more than 50 years. Bowel cancer accounts for around 1,600 deaths in Scotland annually and is the second biggest cause of cancer -related mortality. Scotland has seen a fall in both the incidence and mortality rate for bowel cancer over the last 10 years. The new test follows on from a successful pilot where 40,000 participants use the simpler FIT test. Uptake was improved, particularly in those who had not previously participated in the bowel screening programme. It is hoped that the simpler tests will improve the current uptake level of 56%. The new test is a quantitative faecal immunological test which measures both haemoglobin and calprotectin. It is therefore also frequently referred to as a QFIT rather than a FIT test. Because the test is quantitative, the cut-off points at which to indicate upon the results can be adjusted. The uptake in NHS greater Glasgow and Clyde is not however been as good with only 45.5% of males who were screened participating in the program and 51.6% of females. The overall uptake in Greater Glasgow and Clyde in 2017 was 48.6%. Uptake appears to improve with increasing age. Uptake is lower in patients from deprived backgrounds. 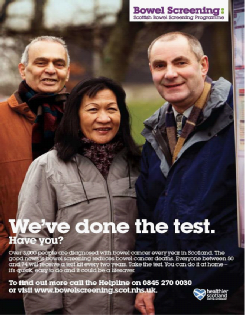 In Greater Glasgow and Clyde around 2.3% of patients will have a positive test. Males are a little more likely to have a positive test (2.8%) versus females (2%). The new test also is more accurate than the older test and may give rise to a higher proportion of positive results. However the sensitivity can be adjusted as the test is a quantitative assessment of the amount of blood in the stool. Scotland is the first country in the UK to roll out the new FIT test. England will incorporate the FIT test into their screening programme in 2018 and Wales in 2019. Northern Ireland has yet to approve the new test.